Here's how you can take down Genichiro Ashina at Ashina Castle in Sekiro: Shadows Die Twice. Genichiro Ashina waits for you near the top of the Ashina Castle area in Shadows Die Twice, and it's this iteration of the boss fight that we'll be covering. He's an incredibly tough opponent to face off against, but in this Sekiro Genichiro Ashina boss guide, we'll be walking you through how to beat Genichiro Ashina in Sekiro, even detailing how to cheese Genichiro in some instances. But first, we'll be providing you with some essential tips in how to beat Genichiro Ashina in Sekiro: Shadows Die Twice. When Genichiro leaps into the air away from you, he's going to let loose multiple arrows, all of which you can deflect. When he jumps near you, he's about to slam down with an attack. The red kanji for this fight can either mean a sweeping slash attack, or a stab attack that you can Mikiri Counter. For all of Genichiro's lightning attacks, you need to be airborne when they hit you. Before you touch the ground press the right bumper, and the lightning you absorbed will be transfered back to Genichiro. Just below, we've divided up the boss fight with Genichiro Ashina into three phases. Yes, although the health bar for the boss at the beginning of the fight indicates that there are two phases to this battle, you're in for a bit of a nasty surprise when you've dealt two Deathblows to Ashina. To kick things off, Ashina will rush at you, letting an arrow loose from his massive bow, before striking you twice with two sweeping attacks. This is basically his go to move when you put distance between the pair of you, so the aim of this, and the second phase of the fight with Ashina, is to stay as close to him as possible. There are several ways of defeating Genichiro Ashina in this first phase. One method is to use the Loaded Axe, and every time you parry a strike from him, let loose with the Fang and Blade ability, which lets you chain three attacks with the Loaded Axe and your sword together, shredding Ashin's posture meter. Another tactic is to basically go ham. It turns out that the majority of attacks from Ashina in this phase are actually quite easy to deflect for some Posture damage. If you really press home the attack on Ashina, hitting him with two strikes to bait an easy attack that you can deflect, you'll go through his Posture meter in no time. The one major thing to watch out for, in both this and the second phase of the fight with Ashina, is his red kanji attack. In the first phase, it's nearly always a thrust attack. Stand your ground, and use the Mikiri Counter ability to stamp on his blade at the last second, following up with a quick few attacks to deal huge Posture damage to the boss. Once you've dealt one Deathblow to Ashina, it's time for round two. This is where things are basically sped up. 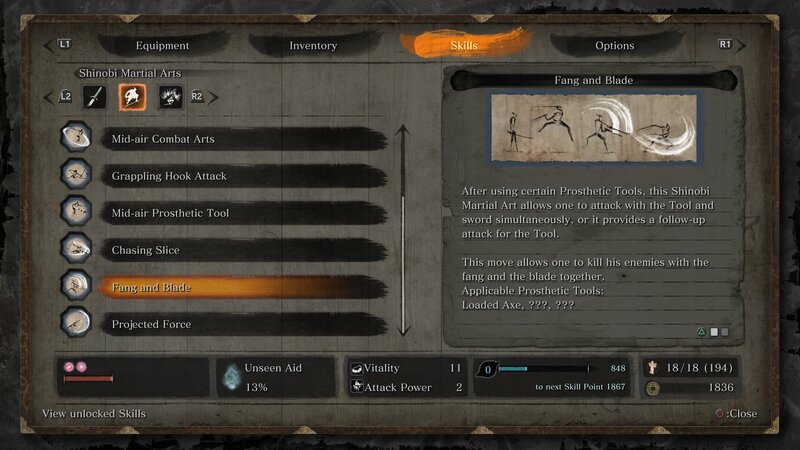 Ashina likes letting loose two arrows to kick things off in this phase, so get ready to deflect them immediately. The one major difference in phase two of the fight is that instead of a thrust attack, Ashina's red kanji attacks now come in the form of a rapid slash. You can either sidestep this attack to the right, or jump over it entirely, jumping off Ashina for some nice Posture damage. And then finally, just when you think it's all done and dusted, Ashina comes back for more. This final phase of the fight is actually a little easier than the first two phases, which we're sure is music to your ears. Ashina's attacks are oddly slow in the final phase, with sweeping and slashing attacks that really don't have much distance on them at all. But get ready for the lightning. Only in this third and final phase can Ashina hit you with a bolt of lightning. The one way to avoid this lightning attack is to be airborne when it hits you. Then, the second you hit the ground after being struck with the lightning, press the right bumper to immediately attack. If you can manage to hit Ashina with this attack while you're amped up with lightning, it'll deal huge Posture damage. This is basically everything you need to know in order to conquer the fight with Genichiro Ashina in Sekiro: Shadows Die Twice. Remember, if you're finding the fight a bit tough (as we definitely did), it's a good idea to retreat a bit down the Ashina Tower and practice your combat dodges and Mikiri Counters on the samurai in blue. Truthfully, there's only really one way to cheese Genichiro Ashina in Sekiro. You can absolutely go ham with the Firecracker Prosthetic, which will stun the boss every time, letting you rip into him with a few clean hits. Alternatively, you can repeatedly go on the offensive in this boss fight, as we've seen countless people do on YouTube, for a quick fight.